The important fact that the Climate Change Conference is taking place on the African Continent for the first time should not just boil down to its mere presence in Durban, but just like key Sub Saharan African economies are emerging, Africa's emerging voice on climate change policy is vital to a number of future developmental areas, not least of which is food security – including all of its pillars from food production to improving the Continent’s ability to feed itself and using renewables to spur better agricultural energy use. However, do Africa’s agriculture, environment and energy ministers talk to each other? And, why aren’t more agricultural ministers included in the climate change discussion and vice versa? This needs to happen, but it is not – at least not regularly or in a comprehensive manner. Most experts recognize that both food security and climate change are affecting the Continent more than any other region of the world. The food security-climate change linkage for Africa hopefully will be heavily on the table in Durban as these symbiotic impact indicators need to be addressed together. Food security specialists from development organizations and civil society (CSOs) to policy makers need to build climate change solutions into their programs. Africa climate change leaders and activists need not forget that the lack of progress on key environmental issues will continue to affect the Continent’s progress to resolve its food security challenges. -- Climate change-smart agricultural production, which helps reduce the impact on the environment such as bio-char (the process of burning plant-based remnants and making charcoal that is then used as renewable fertilizer in places like Congo, and Benin’s Songhai Integrative Farms). The Congo project also obtains carbon credits on CO2 emissions which also further helps overall energy challenges – not just in the country but over the long term for our global community. The UN General Assembly this year called for improvement in sustainable energy by making 2012 the “International Year of Sustainable Energy,” with the goal of providing access to modern forms of energy, particularly for emerging markets and the developing world by 2030. But, if we do not improve our current efforts not only will this "sustainability" goal not be meet for Africa, but the food security-climate change symbiotic link will continue to be exacerbated as Africa’s population is expected to reach 1.9 billion by 2030, and 2 billion by 2050. **** Modern forms of energy use (some already noted above) must be link to addressing food security solutions. Thus, we need to be more Food Security-Climate Change Smart through innovation, Africa-focused research and development like what is being done at Ghana’s new bio tech facility, and by expanding the discussion circle so that both agriculture and environment policy makers, CSOs and development entities begin to come together and share in the same international, regional, community, and village fora to address these two global impact indicators. ****2050 population estimates from “This is Africa,” Sept/Oct edition 2011. There are several key global issues of our day that require constant advocacy and dialogue to ensure that we as a nation and as a global community are doing our utmost to make the world a better place for the next generations. I believe that some of these issues are: Food Security, Education, Environment-Energy, Economics, Democracy- Development, and Self Help, or FEEEDS. --Self-Help – realizing that identity for anyone provides self esteem, but for nations and people of color this also represents both power and empowerment. Food Security Most of the world population, particularly of color, and especially women and children, fail to get enough nutritional food to eat every single day. Most of us have heard the adage that many things in life are about “quality not quantity;”thus, this adage also applies to food security. There is a lack of consumption of the key food groups not just daily, but at every meal for many global communities. What we seem to be missing is the focus on and access to good nutrition. The examples seen around the world in communities, particularly those of color are similar as regards to food security, with the seminal issue being: access to nutritional food. The FEEEDS/FE3DS Enabling Platforms: What are they? 1.) Education: Although many global challenges are connected to FEEEDS/FE3DS®, the way forward on many issues is education, specifically training (also vocational), retraining, formal education, entrepreneurship (SMEs), knowledge sharing, usage and management, discussion, and creative and enterprising development and design solutions, particularly for youth and women. We need to think of education as our new Frontier Enterprise where dynamic development design strategies are created to respond to FEEEDS. Education is not static, and includes more than just basic and/or formal education. 3.) Economics: Economics plays a key role in everything – personal, family, community, and government. If the economic sure-footing is not present then it detracts from progress, vision and future planning. Enhancing living wages, ensuring government leaderships manage budgets and tax payer monies effectively and efficiently to address social service needs – are part of the fundamentals. A reliable, stable economic environment is not only empowering, but powerful and is a pillar of both a strong government, and personal identity, where self-reliance and self-esteem are the order of the day. 4.) Development-Democracy: There is also a linkage of these two themes because democracy – as defined as transparent rules, regulations, stable institutions, and equal access to social services – are a “must-have” to develop communities and address global human values, and improve life-quality – all hallmarks of democracy. 5.) Self-Help: Self-help, a pillar of leadership, is the center-beam. Countries should not always want (or expect) outsiders to always provide, guide, direct, or frame (meaning explain and resolve through their world lens) what the responses to FEEEDS® are. These issues for many nations will need to be driven by country-specific self-help by way of innovative, creative, and sometimes culturally-specific means. Green answers: Recycled glass over plastic requires less energy as recycled plastic continues to degrade in quality; flying during the day; organic cotton over bamboo (Source Washington D.C. NBC local news 9/25/2011). Last year, 2010, I had a wish list for Nigeria@50, a milestone in the life of your nation, which was published in Leadership, the Guardian and a number of other Nigerian newspapers. Leadership has asked me to review that summer 2010 list to see which wishes, in my personal opinion, have come true and which ones are still things to be realized or are in progress. Although I am no longer living in Nigeria at this time, I personally continue to wish the people of this great nation the very best @51 years as it weathers and seeks to manage some difficult security issues. That being said, one huge part of that July 2010 list, which I never wavered on, and that has come to fruition was - a free and democratic election, that Nigerians could be proud of – which by accounts of many international observers happened in April 2011. Other things on that list -- rebuilding agriculture, enhancing transparency, fighting corruption still represent challenges but are being worked. In a July 2010 speech (http://tinyurl.com/2010-50List), I wrote that Nigeria was"@the point where the road to change should be paved with more action on food security, improved education (particularly for the country's nearly 70 million youth & 74 million women), the environment, energy needs, and development," what I have referred to as the FEEEDS® issues over the last year. I will say now, as I did then, that every generation should be a force for change, and every year a marker of progress. So in this 51st year, many Nigerians are working to change the paradigm on the FEEEDS® issues and on past perceptions of the nation by the public abroad. I will continue to do my part to help in these areas. This does not diminish the present serious security issues because they are a reality of the world today, and we all must work together to make the world, and Nigeria safer. I know there are a number of partners working with Nigeria to address these challenges. In the same July 2010 speech, I noted that I wanted to fast forward to summer 2011 when I had just finished reading my Nigerian newspapers which were full of articles about how proud many (did not say all) Nigerians were of their election. This was the case. In the last two quarters of 2011, Nigeria's economic growth is being heralded by many financial experts, with some pundits citing BRICA countries (http://tinyurl.com/TAP-blogitrrs-BRICA), of which Nigeria is one, serving as examples to struggling Western economies. Nigeria’s agriculture has an uptick of 7-8%, but most recognize there is so much more potential in this area; energy still is one of the key challenging linchpins for Nigeria’s development; and most investors are beginning to appreciate the incredible market that Nigeria offers (although American investments lag behind that of China and India in the region). According to recent press reports, the President of the African Development Bank (ADB), Donald Kabaruka, said last week in Washington D.C., during the annual fall meetings of the World Bank Group, that many African nations have "been there and done that" to address some of the economic challenges they faced 2-3 years ago. Nigeria is a good example of this, particularly as regards to banking reform. Your present security challenges I know are at the top of the list of issues to address. I also send my condolences to the families of those who have lost loved ones in the recent security environment. Today in your 51st year, I remain a supporter of your democratic destiny, your progress on the FEEEDS® issues, your push for investment, and development, and the positive paths you will decide to take as a nation in the future. Happy Birthday! 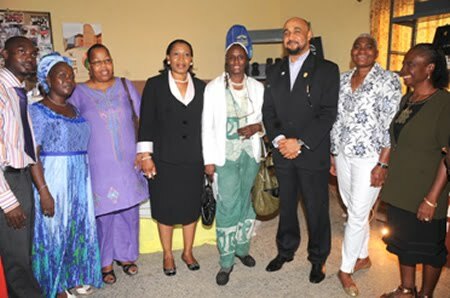 Africare’s International Programs Director, Dianne Forte (second from the right), International Affairs Advisor, Dr. Robin Renee Sanders (fourth from the right), and Nigeria Country Director, Maisha Strozier (third from left), with Lagos Permanent Secretary in the Ministry of Special Duties, Dr. Aderei Sesalu, (third from right), and Director of the Job Creation Center and members of NGO Generation Enterprise. Africare’s International Program Director, Dianne Forte, and the International Affairs Advisor, Ambassador Robin Renee Sanders traveled to Nigeria from June 13-17, 2011 for a field visit to meet with potential Non-Governmental Organizations (NGO) local partners. The visit also included Africare Country Director for Nigeria, Maisha Stoizer. The recent visit strengthens Africare’s commitment to the development of Nigeria and Africa in general and emphasized Africare's programs in health, economic development, women's empowerment, youth, and agriculture, with special focus on the Delta Region where Africare is one of the few American NGOs that works in that region. The field trip included discussions with the Lagos State Government Job Creation Center that works with NGO local partners such as Generation Enterprise which provides vocational and entrepreneurial training for a range of skills from catering, machine and grill works, carpentry, fashion design, welding, and photography. Discussions were also held with Shell, the Ovie Brume Foundation, ExxonMobil, Bank of Industry and others which focused on establishing partnerships to advance the development objectives of Nigeria. There is a spirit we cannot touch but always know is there – It is the "Heritage Within"
The journey is about traditions, like 3-legged wedding pots, Uli signs, adire and ashoke cloth, henna designs, life, and certainly about long talks into the night as deep as indigo blue. Life is a journey and you have come so far, let’s walk the rest of the way together, hand-in-hand, spirit-connected-to-spirit, so that the changes we all seek come from…. -- SMEs are vehicles to employment and job creation. -- SMEs are key to the region's entrepreneurial environment needs. But what else are they? What else needs to be further highlighted? What can those who seek to support their growth do better? We all agree that SMEs -- just like big businesses -- start with a vision, an idea, or fulfill a need in a community. But fundamentally, SMEs play a critical role in nation building, nation advancement, and a nation’s innovativeness. Development cannot happen without them; growth cannot happen without them; socio-economic paradigms shifts cannot happen without them; and poverty cannot be reduced without them. They are what produce a country’s middle class. This is their development enterprise role. Whether one is in West, East, South or Central Africa, the sectors needing development or expansion are the same -- agriculture, infrastructure development (power and transportation), manufacturing, and information technology. But SMEs bring other innovativeness to the table especially for the heavily-populated African urban areas, where cities in the region are expected to grow by 4-5 percent over the next decades (http://tinyurl.com/SSAUrbanGrowth). Meaning current growth rates in sectors like agriculture, currently about 3.5 percent, needs to grow by 6 percent; energy sectors must grow by 7 percent; and, economies must grow by 8 percent or more just to keep pace with the region’s population rate. These are no small tasks (www.songhai.org - Lagos, 6/16/11). There are already reports that the economic boom of 18 SSA countries may hit a snag for some later in 2011, dropping GDP growth rates to 3.7 percent as food prices and energy costs outpace growth (http://tinyurl.com/SSA-economicoutlook). SME stands for Small and Medium Size Enterprises, but today let’s change that acronym to Strong and Maverick Enterprises -- reflecting the development enterprise space of SMEs and micro enterprises or MEs (employing 10 people or less). They are producing, designing, employing, and more importantly innovating. They are development entrepreneurs (http://tinyurl.com/TAPblogitrrs-LagosSMEspeech). So, is there something wrong with this picture? Yes, a lot. These record growth rates are not changing the paradigm of people lives in all tiers of society. If the region has 30 million SMEs, then there is no reason with this kind of growth rate that SMEs should be struggling. There should be more than 331 million successful SMEs in the region. -- Finance, and access to credit are challenges,(as they are for some big business ) so look for low cost loans, government-back programs, and supplement incomes by recyling. (For example, some countries pay small stipends if you take plastic bottles to recycling stations). -- Set business goals, but not in concrete. Some built in flexibility helps to take advantage of unexpected opportunities. It is a pleasure to be here this morning for two reasons: first to be back in Nigeria at a time when you at a turning point for great advancement in your development, and secondly to have the opportunity to speak to all of you today about the role you play in the future of your country. My task this morning from the Foundation for Skills Development is to set the framework for not only what leadership is, but also to talk to you about your role as SMEs in nation building, in nation advancement and in national development. Your country has just had an election that has set the stage for the next few years to be growth and change years for Nigeria, based on developing key critical sectors – especially agriculture, manufacturing, infrastructure development (e.g. power and transport sectors), and information technology. You as SMEs, however, have a special role to play during this period -- to capitalize on this turning point and make things happen for your nation particularly for the next generation, and especially for women. Today, Nigeria has some 68 million young people under the age of 30, and 74 million women – these figures will grown over the coming years with the potential of having nearly 72 million youth in country by 2025, and nearly 78 million women. So, SMEs like you will play a fundamental role in how the lives of both youth and women play out in the next decades. I know that SME stands for Small and Medium Size Enterprises, but today let’s change that acronym to reflect the development enterprise space that your businesses represents, not only for you, but also for those you employ even if it is just you and 10 people or less. The fact that you are producing, designing, employing, and innovating represents the leadership role that SMEs play in the development of any nation particularly in Nigeria given the creativity, ingenuity, and dynamism that exists in every part of society here. You are or will be this country’s middle class, and with that comes certain responsibilities -- not only do you fill the development enterprise space in the world of the private sector, but more importantly as a country develops a strong middle class other social sector changes take place as well. You can demand better transparency, and improved regulatory frameworks (such as access to credit, market access, and incentives, etc). According to Global Finance, Sub Saharan Africa (SSA) has about 331 million people in the middle class, and this is with record GDP growth rates of 5 percent or more, in about 18 SSA countries. So, is there something wrong with this picture? Yes, a lot. This means these record growth rates are not changing the paradigm of people lives at all tiers of society. If Sub Saharan Africa has 30 million SMEs, then there is no reason with this kind of growth rate, and again Nigeria is reportedly at 8 per cent, that SMEs should be struggling. And, you alone as a country should have a larger SME percentage in the formal sector. Thus, for me, I believe that you need to think about the S and the M in SME as representing the Strong, but the Maverick Role you play in society and in transforming not only key development sectors, but also changing other paradigms in Nigeria. This means transforming both agriculture and manufacturing; this mean transforming from simply surviving to sustainability; this mean transforming from just producing to productivity, and finally this mean moving from just training to long term market trade capabilities domestically, regionally, and internationally. Whether you are an urban entrepreneur, or a rural entrepreneur your roles are the same for you in your communities. And, I am talking about communities with a big “C,” meaning not just having an impact on where you work, but also on where you live and on your nation. One of the organizations that I am affiliated with in the U.S. is called Operation Hope. It was just a leading partner in a Summit on Urban Entrepreneurship (http://www.operationhope.org/) at Rutgers University in New Jersey. What this summit focused on was how those in urban areas find ways to create their own jobs; to create their own futures; and to create their own sustainability. But how you say? What does it take? What are the tools? Remember, all of you are here today because you either started with an idea, you saw a need, and you had a vision. [We have wonderful examples of this kind of leadership here today such as my dear friend Father Nzamonjo of the Songhai Centers in Benin, and also here in Nigeria, such as FSD whom you all know, and my young friend Taiwo who will discuss the environmental responsibilities you have as SME leaders as you develop and expand your companies. I also saw great leadership yesterday as I visited a Lagos State Job Opportunities Center in Igando and their work with Generation Enterprise. They all started because of an idea, a vision, and a leadership commitment to fulfill a need they saw in the communities around them. According to Nigeria World (http://tinyurl.com/NigeriaWorld), in 2003, SMEs employed about 60 per cent of the informal and formal labor force in Nigeria. Taking into account current population growth rates this percentage now is probably closer to 70 percent. With your population reportedly today anywhere between 150-152 million, and in ten years could reach 170 million – if your growth rates remain the same . . . your role will not get smaller but larger, and more comprehensive as community change-agents. We too, in the U.S., are returning our efforts to focusing on the importance of SMEs, and their role in rebuilding America’s future. Your role in Nigeria is no different. Your challenges maybe different, but your role is no different. • Work with institutions like FSD that can help you turn and conceptualize your business from vocational training to entrepreneurship. I know that you know all these things, but sometimes it is good just to hear them again. Getting these tools and drivers right is also part of the leadership end of the ledger along with your passion for what you do as SME leaders as a development entrepreneur. I care about issues of food security, education (particularly in entrepreneurial training), environment-energy, economics, development-democracy, and self help (The FEEEDS® issues) as these are the issues that I am passionate about and that I have chosen are important to me at this stage of my life. You have to have that same sort of passion for what you do (Yes, I know the financing, market issues, and profits are the real-politick of surviving), but having passion for your business is that intangible leadership tool that can help you survive, and your business to have longevity. • Set goals for your companies, but not in concrete, have some flexibility built in so that if unexpected opportunities arise, you can take advantage of them. I have intentionally used charged word-phrases like community change-agent when describing your leadership role as an SME because I want you to leave here embolden, energized, and emotive not only about your business, but also about your role in your country’s development as a development entrepreneur especially given the opportunities that lie ahead in this transformative era for Nigeria. You are Strong, You are Mavericks, and you are SME’s! And, you are Nigeria’s future! Coining the Acronym BRICA – Adding Africa's Name to World Regions & Economies in Economic Boom! We have all heard it! We have all read about it! Sub Saharan Africa (SSA) is in an economic boom, so let’s recognize it as so! Thus, FEEEDS® is coining today, on May 25, 2011, Africa Liberation Day, the acronym BRICA. Hence, adding Africa's name to the abbreviation of world economies and regions where economic growth, and other impact indicators - investment, foreign direct investment (FDI), high GDP’s - are collectively outpacing other areas -- even some of those identified in the current BRICS. Although South Africa is included in BRICS, let’s recognize all 17 economies in SSA that have put the Continent on the front economic and investment burner. Many (certainly not all) of the 17 SSA economies contributing to the good news, also had good governance and political stability on top of good macroeconomic reports (i.e. Rwanda was recently named the best world reformer by the World Bank). So, what are the facts! Here is a good checklist underscoring why the “A” must be added to any acronym discussing booming economic growth regions. So move over BRICS, and Welcome BRICA! • In 2025, SSA will have approximately 1.1 billion people of working age (**World Bank speech 5/25/11). • What 2 countries are investing the most FDI in SSA today? 2.) India (ICT & manufacturing & India is fourth largest SSA trading partner). A Few of the Countries on the Move – What’s Their Current Reported GDP? In sum, SSA is not only growing faster than Asia, with 6 out of the world’s 10 fastest growing economies on the Continent, but investment, business, and 331 million new consumers have spurred the region forward. This does not mean that everything is fine. Good governance, transparency, development (particularly in agriculture), and anti-corruption still need to improve in many countries on (and off) the list. In addition a number of the same countries noted above, also lag behind on reaching the all-important 2015 Millennium Development Goals (MGDs) in the remaining 4 years, particularly in health, education, and gender empowerment. Although, FEEEDS® is coining the more inclusive BRICA acronym, the positive economic growth factoids noted above do not exclude the importance and need to address the other pillars of democracy -- good governance, transparency, anti-corruption efforts, respect for human rights, and social sector reform. Not all the countries on the economic growth list have addressed (or begun to address) these other key democracy issues. However, they will need to in order to maintain the projected positive economic forecasts for the long term, but more fundamentally it is what the people of this great Continent deserve. In addition, friends of Africa hope that many more SSA countries turn the economic corner, along side of greatly improving their democratic landscape. On the flip side, however, businesses from countries (e.g. U.S.) other than Brazil, India, and China are certainly missing out on Africa’s Rising. The majority of international and local civil society observers saw the results of Nigeria’s election series on April 9, April 16, and April 26, 2011, as credible. However, they, along with the opposition also noted irregularities such as underage voting, improperly used ballots, and mishandled/misplaced ballot boxes, coupled with the sad fact of election violence killing nearly 800 as noted by Human Rights Watch (HRW http://tinyurl.com/HRW-Election-Violence). Many of these same irregularities have been cited in past elections since military rule ended more than 30 years ago. However, in 2011, these improper actions were significantly reduced with much of the credit for this positive change going to the well-respected Chairman of Nigeria’s election Commission -- Professor Attahiru Jega. With a credibility stamp on the overall 2011 election results, even with the irregularities and violence, the post-election landscape is going to be equally as important with the need to address some of the underlying development issues that could have contributed to election violence. So how to reach out to all Nigerians, particularly the youth and especially the northern youth, so that they feel, as one nation, they can play a part in the country’s future? There are about 45 million youth in today’s Nigeria. And, from now to 2025 that 45 million is likely to reach 62 million if Nigeria’s population trajectory remains on track (http://tinyurl.com/The-Africa-Post-blogitrrs). The post-election landscape will have to focus on some of the FEEEDS® issues, especially food security, education, development, and addressing evolving democracy efforts (e.g. anti-corruption). Social sector reform in education, health, and housing as well as transformative institution building in those same sectors is needed so that youth and women, in particular, can play key roles in the country’s future. Transparent investment and value chain development in sectors such as agriculture, energy, and infrastructure, including taking renewables and appropriate technology into account, will be fundamental to Nigeria’s advancement over the next 20 years -- or more simply put -- for the nation’s next two generations. Changes in these areas will ensure self-sufficient food security, but also maximize the export potential of key commodities from rice and cassava to maize and cowpeas, including increasing trade of unique national products such as shea butter, palm oil, and coco, to northern Fulani and Hausa crafts, and indigenous textiles like indigo-based adire or ashoke. Addressing all of these issues will create two things: an educated and trained citizenry, and entrepreneurs and/or jobs. If one travels throughout Nigeria (and I have to all 36 states), particularly in the North where negative human index indicator numbers are much higher (infant mortality, out-of-school girls, malnutrition), there is a visible need to respond to these socio-economic issues to meet the aspirations of young people at the poverty level or in the middle class. The youth, as well as Nigeria’s 74 million women, will need to have employment opportunities (entrepreneurial, vocational, or formal private sector). The young will need to feel hopeful about opportunities -- or at least know there are transparent frameworks (institutions, processes, and regulatory environments) -- allowing them to outline a way forward for their future. People are hopeful when transparent frameworks are in place. Without them, without hope, then there are few alternatives, leading to frustration or in some cases violence that breaks down often along religious and ethnic lines. Looking at the violence that mostly took place in the North, and the fact that the 12 core Northern States went to opposition presidential candidate, retired General Buhari, (see stark red & green map http://tinyurl.com/Election-Results-Map), underscores the outreach still needed in the region. Two predominately Muslim states in the East, Adamawa and Taraba, went to the President-elect. It is okay to have political differences within a nation -- most democratic countries do -- as democracy also means respect for differences in views, culture and religion. But differences cannot also include hopelessness because social sectors needs are not met for parts of the population. So what should be on the Post-Election To-Do list? • Establish a more reliable and affordable mortgage program so anyone at any point on the social economic scale can count on a framework that provides housing. A viable and affordable mortgage system, available to all, does not exist in today’s Nigeria; Housing is a big issue for many. All in all, Nigeria’s post election environment represents an opportunity for the country’s leadership to change the key paradigms that will provide a new enabling environment for a new Nigeria. Despite the good macroeconomic news in Nigeria and some visionary Governors (e.g. Lagos, Katsina, Akom Ibom, Rivers, Gombe, etc. ), there are real poverty issues for many. I have also seen this poverty firsthand. Also, few job options exist for the educated. If some of the frameworks noted above are transparently addressed, then hopefully, this election -- with its international stamp of credibility -- will be a turning point for many in this nation of 152 million people. Fashola sees April 2011 election results as credible; Jonathan worked the hardest. I had the honor of personally hosting a luncheon on May 16, 2011 for the newly re-elected Governor of Lagos State, Babatunde Fashola (SAN) at the Army-Navy Club in Washington, D.C. in conjunction with the Constituency for Africa -- one of the leading U.S. advocacy organization focused on Africa. As I introduced the Governor, I underscored the extraordinary commitment, dedication, and vision of this extraordinary leader. The luncheon event was attended by 50 key civil society, academic, and private sector representatives interested in hearing the Governor's vision for one of Nigeria's most important states -- Lagos -- where the capital city of the same name (Lagos) heralds a population of 18 million. Winning re-election with 82 per cent of the vote, Fashola told the assembled crowd that his vision for the next four years for his State focused on infrastructure development, particularly in mass transport (rail, bus, ferries), the housing and agricultural sectors, as well as on educational and training programs for youth. I have seen personally the transformation of Lagos from 2007-2010 during the time that I lived in Nigeria as a result of Fashola's leadership and I have no doubt that during the next four years he will continue to move the country's commercial capital forward. Noting to the crowd "the importance of coming and seeing Nigeria first-hand," he told the U.S. group that they could not understand and invest in Nigeria unless they actually came to the country to appreciate the array of investment opportunities there. In response to a question on the recent Nigerian elections where 22 million of Nigeria's 74 million registered voters participated in the April 2011 voting, Fashola acknowledged the irregularities in some polling places which he said needed to be addressed. He also stressed his concern about the violence that occured, but he added that the outcome of the election was credible and gave high points to President-elect Jonathan for "working the hardest" during the campaign and trying to reach out to Nigerians all across the country.(http://tinyurl.com/Leadership-News-on-Fashola). In my view, the key now will be the next steps for the country, particularly efforts to address key social sector issues for Nigeria's nearly 64 million youth, and addressing the underlying causes of the violence (need for education, training, better health care, and job opportunities) in the country's north, where according to Human Rights Watch nearly 800 people reportedly lost their lives (http://tinyurl.com/HRW-Election-Violence). Most Africa watchers recognize the enormous and limitless potential of Nigeria to expand its global and economic leadership, but more needs to be done to address social sector issues and the extraordinary vision, dedication, and commitment by extraordinary individuals such as the results-oriented Governor Fashola of Lagos gives us all hope. Good afternoon graduates of Robert Morris University. I know this is a proud day for all of you, your families, and your friends. Today is not like any other day. [Because] it is days like today that call for a certain amount of reflection in both directions….where you have come from…and where you are going. I had the pleasure last year to sit exactly where you are sitting now. I had the same two-directional challenge, two-directional reflection that you are experiencing right now – how you got to this moment in time, and where you are heading when you depart this great hall this afternoon. So given this reflective juxtaposition I wanted to share with you some of the things that were on mind that day, May 6, 2010, as they may be on yours this day, today, May 6, 2011. I also want to touch on some of the elements or sure footing that you have gained during your time at RMU. What were the three word-phrases that came to mind, for me, when I thought of my time at RMU -- Richness in spirit, Meaningful in action, and Unity of Purpose. I remember writing this on the back of my program book last year as I sat where you are sitting today. I still have those notes, and whenever I think I am off track I go back to these word-phrases. [You know] we are still in the first half of the 21st Century but so many world-changing events have taken place in not just the last 11 years, but in the last 12 months, … the last six months, event the last six days. Probably unbeknownst to you … as you struggled to get those last papers and projects finished…and I do remember that well… you did not factor in your own role as a change-agent in the 21st Century…but you are. Your time at RMU –- is an incredible marker in your future as are the degrees you have just obtained – from masters in business, engineering, leadership and management, to doctorates in nursing, and information systems and communications [to name a few] – all are the leading disciplines needed today as our global and community needs are tremendous; our global and community challenges are tremendous; and our global and community worlds are changing at a nanosecond rate. But, what is also tremendous today, are the opportunities; they will be unlike anything that we have ever seen before. [Let’s] reflect back on the unity of purpose that you have gained over the last 2-to-3 years at RMU and talk about taking that same effort with you as you move forward. So what have you gained? You have gained cutting edge, specialized professional degrees that allow you to compete; that allow you to lead, direct, and [more importantly from my viewpoint] be innovative. We are in a society that is at a turning point as to where it wants to go for the remainder of this Century. This is the game point, right now, at this moment. This is meaningful. But, when you step outside this afternoon, after this event, you will enter the realm of the second reflective direction that I mentioned earlier in my remarks -- Your Way Forward. So what are your impact indicators; meaning what will be the things that are important to you…to do…to change, to improve upon, and to give voice to? This second reflective direction should and must be transformative. It will take a commitment from each and every one of you to be change-agents either in your communities or, if you chose, on the global stage. You can act and work locally but I encourage you, in doing so, to think globally. I know I am not the first to say this, but I believe in it so much. I know that many of you have heard the phrase social contract – generally meaning the responsibility that a government or institution has to its citizens or its members. However, you too, as new graduates also have a responsibility; let’s call this your social accord, your social compact. So what is going to be your social accord, your social compact to take the richness gained here and turn that into a unity of purpose for your communities, and this nation? RMU made a social compact with you and this has been fulfilled today. Your next step will be the social compact you design for yourself…… think about what that is going to be. Then honor it, work toward it, make it real, and make it tangible, including reaching back and helping someone else. These are the building blocks of your impact indicators and can help you with your thoughts as you begin this next phase, this transformative phase of your life. To underscore and illustrate this point, one of the most impactful books I read while I was at RMU was the Scientific Revolution by Thomas Kuhn. I remember initially thinking that it was about the changes in technology, about the nuts and bolts of the information age and where this new knowledge would take us. But the message was not about technology per se or a paradigm shift in what you do, but more so, about a shift in how you think, about how you see the world. This is what you accomplished here -- a shift in thought, as you became more innovative, more imaginative, more creative, and certainly more curious. These are the impact indicators you have gained from your time at RMU, and that we count on you to use as you embark on this transformative phase. I am currently working for one of the oldest non-governmental organizations in America, called Africare, which focuses on helping people in Africa build new lives, and giving voice to those less fortunate. Why? Because I care about the issues of food security, education, environment-energy, development, and respecting the principles of democracy, here in the United States and abroad – what I like to call the FEEEDS® issues, representing the first letter of all the things I have chosen that are important to me in this phase of my life. These are the impact indicators that are part of the design of my current social compact. When I lived in Portugal, many years ago, there was a wonderful idiomatic expression that I was thought was quite emotive – toca a pele –meaning when something is so fundamental to who you are, or where you are going, and what you want to do that it touches your skin. You must use these degrees and turn your RMU education into something that achieves this sense for you. The professional and technical education you have received at RMU have given you the tools to contribute economically, philosophically, innovatively, and personally to our ever-changing world with theoretical, practical and applied knowledge. It may be tough on occasions as you may be the only voice out there on a particularly issue, a new approach, a new medical breakthrough or paradigm of thought….but you need to know that this is ok too. Do not give that up. There are wonderful examples of this today. I love social media and I admire Mark Zuckerberg of Facebook fame because he fundamentally created a paradigm shift in thought that has not only changed how we communicate with each other, but also how we communicate world-wide, and how we see the world, and what we want for and from our communities. It almost does not get any better than that in my view. But I also know that many of you will show your communities that same kind of innovativeness, that same kind of creativity, that same paradigm shift in thought bringing new tools to the table in action, in models for business and engineering, in nursing, in technology, in education and for the environment in wherever your day after tomorrow takes you. Remember that I am talking about communities in the broad sense, with a big “C,” as communities are not only where you live but where you work, where you worship, and where you volunteer. There is no script on what to do, or on how to do it -- but there are some parting suggestions that I want to share with you -- call it a “cuff list” if you wish that you can keep in mind as you take the unity of purpose gained here and transform it into the next phase of your life. -- Last but certainly not least [and this is probably the most important thing I can leave with you this afternoon] do not forget to Live Life in the Process. I have intentionally used charged word-phrases such as community or global change-agents, impact indicators, and the importance of having a personal social compact because I want you to leave here this afternoon emboldened, energized, emotive, but not nonplused, and maybe even with a certain verve because your transformative phase awaits you. Panelists and special speakers at Africare-Atlantic Council-Carnegie Mellon Nigeria Election Forum, from left-to-right: Dr. Gwendolyn Mikell, Mr. Reno Omokri, Mr. Oronto Douglas, Mr. El Rufai, Dr. Robin R. Sanders (former U.S. 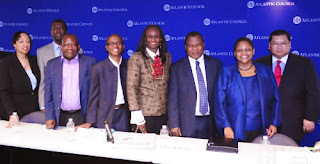 Ambassador to Nigeria), Ambassador Adefuye (Nigerian Ambassador to the U.S.), Dr. Jendayi Frazer, and Dr. J. Peter Pham. WASHINGTON, DC, Wednesday, April 20, 2011 – On April 19, Africare, in partnership with the Atlantic Council and Carnegie Mellon University’s Center for International Policy and Innovation (CIPI), organized a forum that focused on the “ Initial Assessment of Nigeria’s 2011 Election.” Most of the panelists were in Nigeria during the recent elections and gave firsthand accounts of what they saw on the ground. Many of the Forum’s presenters were in agreement that these latest elections – both parliamentary and presidential, held April 9th and April 16th respectively – were the most credible and well-organized national elections Nigeria has ever seen since the onset of its democratic experience (the country was ruled by military dictators for 30 years and made moves to establish democratic principles 11 years ago). Most panelists were optimistic about the future of Nigerian elections and noted that the problems identified during the elections could be worked on and did not affect the outcome of the elections. On the other hand, Mr. Nasir El-Rufai, a prominent Nigerian political figure and former Nigerian Minister of the Federal Capital Territory, cautioned attendees about the dangers of too much self-congratulatory statements, given that there was not only a geographic split in the country in support for the two candidates (most of the North voted for opposition candidate General Buhari), but also that many in the country’s northern region felt that their votes were not reflected in the outcomes of the vote count. El-Rufai did add that the 2011 elections were much improved from the 2007, or 2003 votes, but that more work still needs to be done before they could be considered completely free and fair. El-Rufai continued by calling for even more electoral reforms, specifically electronic balloting and a centralized vote tally location, which would eliminate much of the human element of vote counting and transportation -- thus protecting every Nigerian’s vote. Other key speakers included Ambassador Jendayi Frazer of Carnegie Mellon and former Assistant Secretary of State for Africa, who gave introductory remarks; Dr. Gwendolyn Mikell, Professor of Anthropology and Foreign Service at Georgetown University and Dr. J. Peter Pham of the Atlantic Council, both who served as official observers of the Nigerian elections; and, Mr. Reno Omokri, Founder, Build Up Nigeria Project, a non-governmental organization focused on youth. The event was moderated by Ambassador Robin R. Sanders, International Affairs Advisor and Communication Outreach Director for Africare, representing Africare’s President Dr. Darius Mans. Other key speakers included H.E. Adefuye, Ambassador of Nigeria to the United States, and Mr. Oronto Douglas, Senior Special Assistant to President-elect Jonathan whose contributions were also both informative and lively. Overall, panelists agreed that the recent political violence and bloodshed that has taken place since the elections is of grave concern and that all parties should seek peace and address any concerns through legal processes. Key take away points included the importance women played in the voting process as noted by Professor Mikell and the large number of youth who participated in the elections, as mentioned by Mr. Omokri. In addition, the panelists highlighted the importance of the upcoming April 26, 2011, gubernatorial elections and the need for those to not only be peaceful, but also further address some of the challenges that were seen in the April 9th and April 16th elections in order to make them even more transparent. Everyone agreed that Nigerian President-elect Goodluck Jonathan will need to work after the election season to ensure that all disparate groups in Nigeria feel that they have a role to play in nation-building in order to create an environment where the country can grow and prosper politically, socially, and economically. After significant logistical missteps that sent serious concerns throughout the Nigerian electorate hoping for the first credible polls since the 1990s, the country and many of its friends around the world are hoping that the rescheduled first round elections on April 9th, 2011, get off on the right foot. Nigeria has incredible potential. This phrase as been uttered many, many times before; it is not new. What is this potential? To be a strong democratic, economic, stable, prosperous powerhouse from which its people benefit, serving as an example for both the sub-region, and the rest of the Continent. This is the “bumper sticker” that many Nigerians want to see become the order of the day. No one doubts the importance of Nigeria and no one doubts that whatever happens in Nigeria matters to the rest of the Continent, and to its friends in the global community. However, the cloud over the potential of this great nation has been an election culture for more than a decade, on top of the years of military rule, which has inhibited the nation’s ability to hold transparent elections. It really is time to get this right so that the Nigerian people can believe in the elected officials of their nation. It really is time to overcome the cloud of confusion, fraud, and rigging that has plagued every election since the 1990s. It really is time for Nigerians to no longer feel disenfranchised, desponded, discouraged, and disappointed because a free, fair, credible and transparent election cannot be held in the country. It is time to get it right. It is time for those involved in the election process at all levels (political parties, candidates, election workers and party agents) to do their utmost to support the efforts of the well-respected Chairman of the Independent National Election Commission (INEC) who (like many Nigerians) wants to turn the page on Nigeria’s elections of the past, and make it a new day for the country -- finally putting the naysayers and critics out of business. It is time to get it right. -- Will there be enough ballot papers, since ballots are being printed as Election Day approaches to cover the likely deficit since some papers were already used on April 2? -- Will the logistical challenges regarding the distribution of election material be overcome this time? (Some unconfirmed reports imply the serious logistical snafus were a nefarious intent by some involved and/or working on the election to cast doubt on the process. There is no way to know if this is true or not, but the point is to move forward). -- Will the ballots already used on April 2, 2011, in some states be handled properly so that they do not cast doubt on the outcome of the elections? (Reports are 6-9 of Nigeria’s 36 states did not have election materials last time). -- Will the process be peaceful, so that Nigerians can vote in the right enabling environment? Nigerians want the right to vote; they shouldn’t have to face any violence in getting to the polls. These are challenges. However, that being said, the popular sentiment of many Nigerians is that they want a good election; they know that it is time to get right. The back story is that April 2, 2011, has come and gone and we can all hash over what went wrong and why. But now, it is time to focus on tomorrow, it is time to get it right this time, and it is time to turn the page on the bad elections of the past. Friends of Nigeria are hoping that despite the missteps to date (and there have been many), that in the end, this country of 150 million people with incredible potential can get past the past; hold a reasonable series of election processes on April 9th, 16th, and 23rd (the current proposed election schedule); and, have election outcomes that its nationals believe in, see as transparent, and most importantly regard as credible. The odds are not great right now. But on this election eve, all the friends of Nigeria are supporting those Nigerians who want to make this process different; who want to end the culture of voting fraud, political indiscipline, and lack of respect for the election process; and, who want the nation’s future to be different – living up to the potential that we all know is there. The Power Relationship: Why it Exists, Where it’s Going? Why is a country like China, now eclipsing Japan as the second largest world economy with a 2010 growth rate of 10.3 percent, and sub-Saharan Africa, identified as the next emerging market frontier with growth rates in the region projected to reach 5.5 to 5.75 per cent in 2011 and 2012 (http://tinyurl.com/IMF-World-Update) developing an economic and business relationship that has everyone talking? Because they need each other and the linkages are not only unmistakable, but profound. For both China and sub Saharan Africa, there are some fundamental facts that underscore not only the potential strength of the nascent relationship, but what some would call the symbiotic nature of the relationship’s future progression and impact on the world’s economy. At a February 2011 Washington, D.C. Woodrow Wilson Center event, World Bank Managing Director Okonjo-Iweala made this point clear when she said that “the debate is no longer about whether China should be in Africa; it is there. The debate today is about what the nature of the relationship should be. China has a long term strategy for Africa; Africa does not have one for its relationship with China” (http://tinyurl.com/Woodrow-Wilson-Center). Her point is that Africa needs to have a short, medium and long-term plan, as well as strategic direction about the Africa-China relationship. --For Africa – having resources for commodities, its own domestic demand for commodities and a large population. Thus, there is no coincidence in the nexuses listed above – resources, commodities, and population. Population for both China and Africa are one of the biggest elements in their symbiotic relationship. China falls on the need side of the equation as it population needs both resources and commodities. Africa’s population is on track to be home to 1.9 million people by 2050, with half being under 25 years of age (http://tinyurl.com/RRSanders-Blog). Its population should be responsible for taking the lead in not only developing the natural resources but Africa’s leadership will need to ensure transparency in both the extraction of its resources and the financial gains. Approximately 40 percent of both Africa’s and China’s populations live in cities – meaning growing urban consumers demanding commodities (http://tinyurl.com/McKinsey-Lions-of-Africa). On Africa’s side of the population equation, the Continent needs investment, training, education, and development – all elements China can bring to the table to help Africa reach its Millennium Development Goals. What is the focus of the Relationship? Right now the offerings from China are primarily in two areas: business and investment, with a number of key countries in its sights. Nations such as South Africa, Nigeria, Angola, Zambia, Mauritius, Kenya (pending port deals), Mauritius, Ethiopia (electric power), and Tanzania (recent $3 million in coal/iron sectors) are targeted countries for China’s interest. However, the main focused of China’s activities are in extractive areas (coal, copper, iron, oil, etc); agriculture (142 projects by end of 2009), infrastructure (construction), and forestry. (http://tinyurl.com/Foreign-Affairs-Africa-China). There are also reportedly 100 million Chinese living and working in Africa from businesspersons to sellers in African markets (http://tinyurl.com/Guardian-Invasion-of-Africa) -- establishing and building both investment relationships and family ties for the long term. According to China’s official white paper report on Africa issued at the end of 2010, China invested approximately $9.33 billion on the Continent writ large (figure includes Egypt) and also has goals to develop economic zones in Zambia, Mauritius, Nigeria, Algeria, Egypt, and Ethiopia with some monies from China’s new $5 billion China-Africa Development Equity Fund and the China Export-Import Bank. Two-way Africa-China trade, which is growing at roughly 44 per cent per year, is over $114 billion and a new $1 billion SME fund for Africa was also established according to the 2010 report(http://tinyurl.com/China-White-Paper) . -- Mozambique: $214 million to help improve communication infrastructure. The bank’s overall investment at end of 2010 was reportedly over $200 billion (http://tinyurl.com/Dengruo-Africa-Finance). As African commercial banks are cautious about investments, China has stepped in as a financier of key major projects. We can expect more along these same lines in the future. Let’s not forget that China is also financing the renovation of the African Union Headquarters in Addis Ababa for approximately $100 million (http://tinyurl.com/Ethiopian-Review), and collateral oil deals with countries like the Republic of Congo. Africa’s Economic Outlook- A New Emerging Market Frontier? -- Technology is transfered to Africa’s next generation. If these steps are followed by Africa then the Africa-China economic relationship, which is certainly here to stay, can serve both well. How Africa manages its relationship with China, by making it more strategic, with long-term planning can lead to the type of growth and development that those of us who are Africa activists want to see for the Continent. Can sub Saharan Africa be the next bread basket for the world, helping to address global food security issues? The answer is yes; the challenge is how. Sub Saharan Africa and the rest of the developing world have a key role to play in leading, designing, deciding, and shaping food security policy for the coming decades. Why? Because of several key indicators that should not be either underestimated or overlooked. For sub Saharan Africa the indicators that are the most important to focus on are: its population size and youth bulge; its ability to manage its water resources; and, its available arable and cultivated land. Looking at the indicators of population, economic growth, water and land use – what I like to call key impact indicators on food availability – sub Saharan Africa has an opportunity to do things differently earlier on its development and modernization life, something that few other world regions have today outside of Latin America. * Africa should be one of the leading regions in shaping global food security policies and feeding the future instead of others shaping it for Africa. Developing practical, integrative and more small scale solutions for agricultural inputs and outputs, farming, and for managing both land and water resources -- will help Africa provide for future generations on the Continent and elsewhere (http://www.guardian.co.uk/environment/2011/jan/13/world-hunger-small-scale-agriculture). Who are the next generations of farmers and where are they going to come from? Sub Saharan Africa’s population is young, with more than half of the people living on the Continent under the age of 25. With current continent-wide population growth rates averaging 2.45 and estimated to remain on that level up through 2050 (www.data.un.org/data), Africa is on track to be home to 1.9 million people by 2050. In addition, although Africa is the third largest continent, it is reportedly the fastest growing with reportedly the billionth person born there in 2010 (www.overpopulation.org/Africa.html). With half its population being under 25 now and if the trajectory remains the same, Africa would be host to 29 per cent of the people in the world of that age group. What does this mean for the foundations of food security (adequate, nutritional, and available food)? It means that Africa must encourage its youth to see its food security issues as vital to its development in the first instance and be a exporting Continent of key staples in the second instance. Most African countries remain major importers of key staples such as rice, maize and wheat, and are not self-sufficient in cassava, cow peas and other commodities. In addition innovation and integration needs to enter the picture more as both exports increase and crop self-sufficiency issues are addressed. Alternative crop uses must also be sought. For example, Nigeria is host to a cooperative based cassava-to-glucose agribusiness (a non-traditional use of cassava) which supplies glucose not only in Nigeria but to other countries in the West African sub-region. With this large population, and the sheer size of the continent, the affects of poor development in food security policy going forward will likely hit Africa harder than any other region. But solutions need to be thoughtful and forward leaning. So what to do? a.) Focus on training this cadre of youth to see farming in a new and different way, along with a different approach – organized small scale farmers (cooperatives or groups of cooperatives) that produce quality and improved yields in environmentally sustainable ways (i.e. waste management, using solar and wind energy, etc.). c.) Seek integrative solutions connecting food security to other quality of life issues such as health (food storage and safety) and education. Some of the best small scale projects in sub Saharan Africa are examples in Republic of Congo, Benin, Tanzania, and Nigeria and several other places where health issues of cooperative farmers are addressed along with food safety and storage or when small gardens are developed for schools, ensuring a healthy school time meal for students, teachers, and mothers who bring their children to school. Benin’s Songhai Integrative Projects uses appropriate technology, bio-gas and environmentally-sound approach to cooperative farming and small scale agro-industries (http://www.songhai.org/english/). The outcome: Reduced hunger, along with poverty reduction can occur as increased, quality yields are sold at market (or exported regionally) for income that can be used to address other quality of life issues (i.e. paying for school fees, housing and health services). With proper planning, the right democratic leadership, and transparent resource management, forward leaning innovative food security policy, and integrative agriculture inputs and outputs, Africa’s young population over the next decades can contribution enormously to addressing both continent-wide and global food security issues as many of the world’s future farmers are right now today on the Continent. *I define and use the term impact indicators as those issues that directly affect positively or negatively food security such as population, water, land, and economic growth/development. **N.B. Use of the term Africa and all stats refer to sub Saharan Africa.